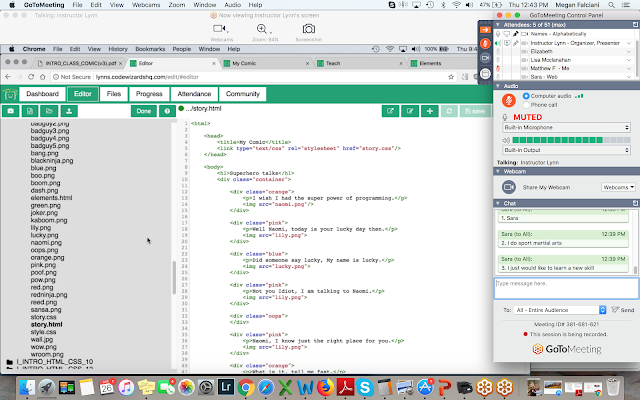 One thing on Matthew's "wish list" for electives is learning how to code. I've been looking for a program, but he's in an odd age bracket. Most of the programs we've found are online guides targeting elementary-age coding hobbyists, rather than actual classes presenting a program that could be high school credit-worthy. 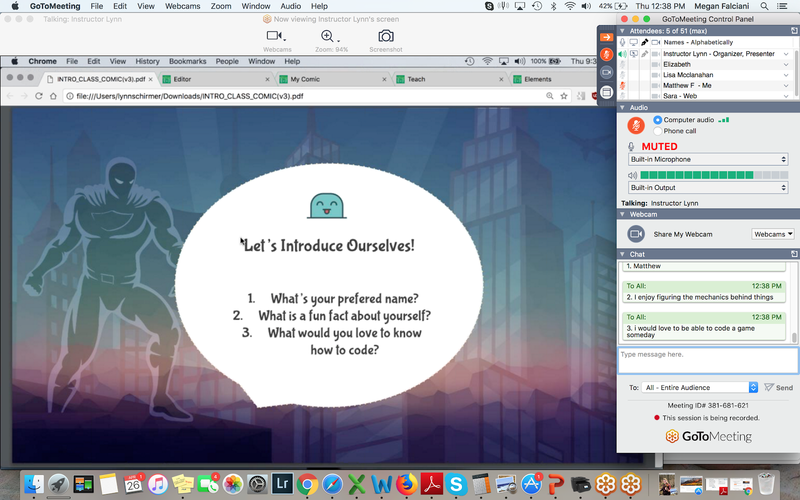 We were given the opportunity to experience and review a class from CodeWizardsHQ, which has a different approach to coding for students in grades five through ten. 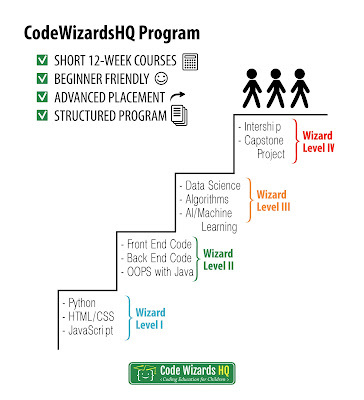 CodeWizardsHQ provides weekly live, instructor-led online classes in a small group setting. Each class has six to eight students, so you get a real interaction with both the instructor and other students. Students can ask questions, and have them answered in real-time. The instructor also has their screens mirrored at her location, and she can help target any single-line errors before they cause a cascade of problems. While they are homeschool-friendly and have a homeschool group option, the company welcomes children of all educational backgrounds. Classes are available in afternoons and evenings, making it ideal for both home- and traditionally-schooled students. If your child has an exceptionally busy week and misses a class, there is a video option for viewing the course material and "Office Hours" to get one-on-one assistance from an instructor if he needs clarification. Certificates of proficiency are issued at the end of each program, creating achievements that can be highlighted on a college or job resume. This made the program very appealing to us because it would provide instruction that had a practical application to Matthew's long-term academic and career goals. The class' instruction platform is GoToMeeting. CodeWizardsHQ recommends using a headset with microphone for better sound quality, but you can use the ones native to your computer. Normally he would use a headset, but since I was sitting in, we used the laptop's devices. The sound quality was fine for us. We didn't really need the microphone, as most communication was through the chat feature. However, I think the microphone might be used more in long-term class sessions. Though our instructor, Lynn, did her best to foster a good camaraderie, I think our group was on the quieter side and content to communicated through texting. It might be different in a long-term class, where students have a few months to get to know each other better. Lynn asked everyone to introduce themselves with the answers to three queries: what is their preferred name, what was something fun to know about them, and why do they want to learn coding? 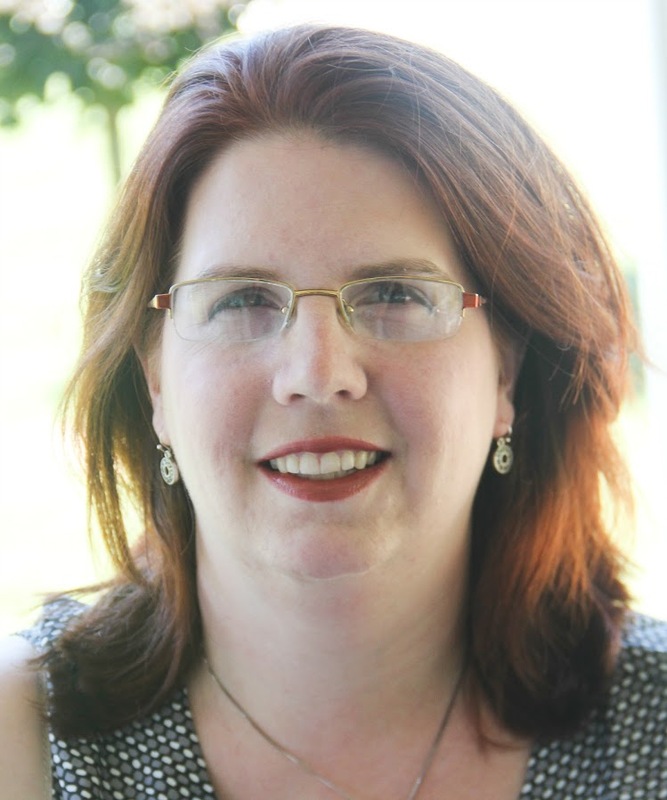 She introduced herself as a Seattle-based Front End Developer with over 20 years of experience in the field. She is also an artist. Matthew responded that he likes picking things apart and wants to be able to write video games. Lynn told him that's a pretty common reason why kids take their classes, and if he was interested, further study could get him in that direction. 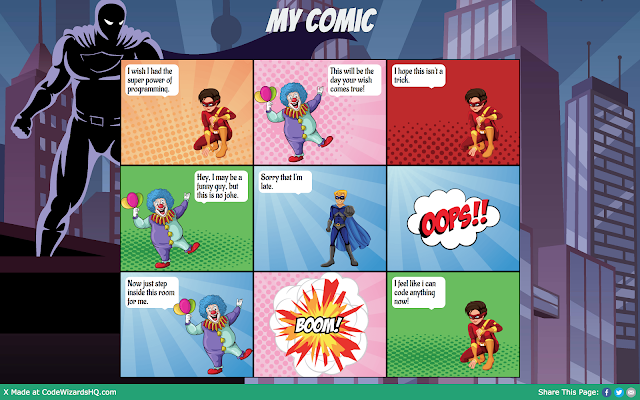 The class' goal was to build a simple comic strip on a web page. First, Lynn walked the students through the interface they'd be using. She gave them a brief history of HTML, along with a few pertinent definitions. then they began building. One thing she pointed out is the kids aren't in total control of the web page. There is some coding that is pre-written and clearly delineated with "Do not edit above this line" or "...below this line." This means that things like the page background, social media share buttons, etc. are available (and intact!) when students are done. 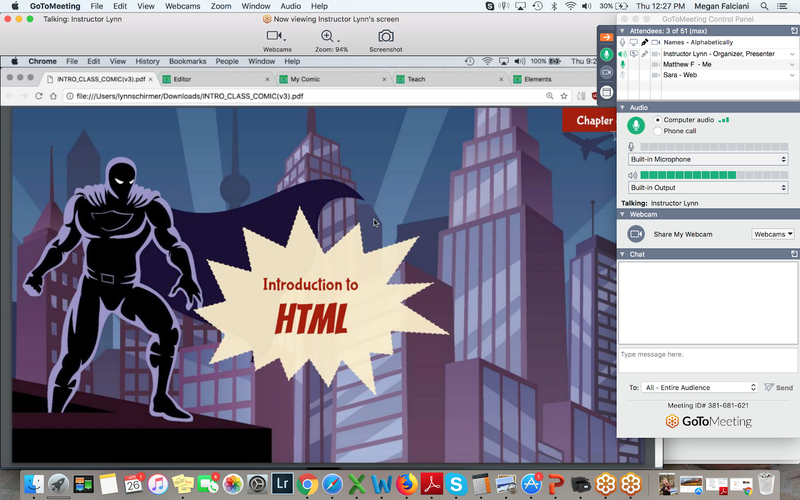 While Lynn did show them how to find/create their own files for customizing their web pages, most of what they worked with were files that had been pre-loaded to the class site. It appears nobody blew up the internet (including my kid), so I call that a win. For this class, there was a good deal of cutting/pasting/changing, as opposed to writing from scratch. I don't think this means the instruction takes the lazy way. I know when I've done even simple coding, I've tended to work in "batches" - where I'll cut/paste a frame and then enter in modifications. It takes too long to write the same things over and over, so I will set up the framework of what I want and then just edit in the different details. However, it is easy to get lost in what you've pasted and need to change, so being attentive and careful was an area where they were given special attention. This class was more to show reviewers how the classes worked, and the kids got a simple project. I laughed when I saw Matthew's page. I thought it was quite humorous. I noticed that he was pretty quick at running with the ideas. He has a little bit of coding experience (he is an avid Minecrafter and has built a Kano computer), so he had a basic understanding to build on. He really enjoyed the class and is lobbying to be enrolled in the regular program. Quite honestly, it's been some time since I've seen him this intense with schoolwork. I don't usually comment on the cost of programs that we have reviewed, but I need to give other parents a heads up. The regular program costs $149 per month, and each class takes about 12 weeks to complete. (The accelerated courses have the same overall cost, but paid in $149/week increments.) 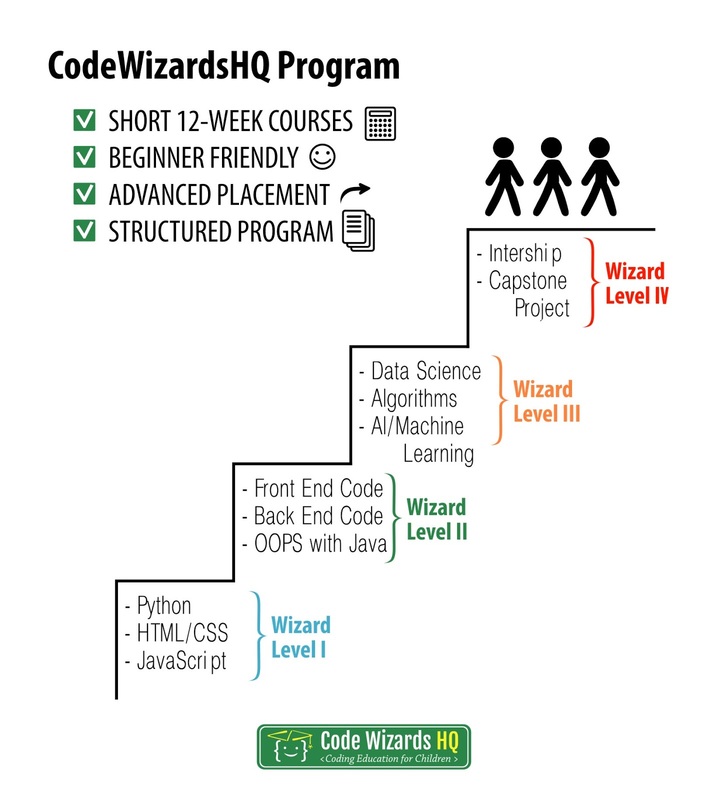 If your child has serious dreams of going into fields that require coding knowledge and experience, I think CodeWizardHQ is a worthwhile investment in your child. However, it is expensive, and I would feel my review was a little misleading I didn't share that when you add it up, it does lead to a bit of sticker shock. However, there are scholarships available, so I'd look into those before ruling the program out. I was impressed with the caliber of the class. I think what Matthew learned was simple enough that the class wasn't overwhelming, but he didn't feel like anything had been dumbed down. (CodeWizardsHQ recommends their course for ages Normally there would be a project to be worked on during the week between classes, but for a single self-contained class, I felt like he learned quite a bit in the time they had. I need to figure out if we can work them into our budget, but we are seriously considering this program for him. 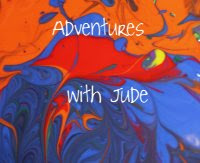 If you'd like to see an overview video about the program, click the video embedded below. To read about other Crew families' experiences with CodeWizardsHQ, click the banner below!